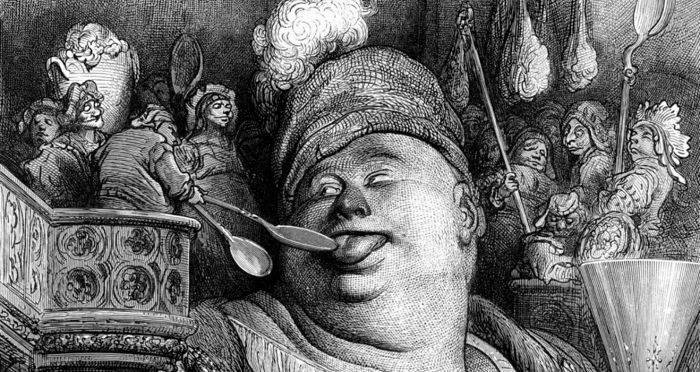 Gustave Doré illustration from Gargantua and Pantagruel. Circa 1860-1870. Tarrare, an 18th-century French showman, could eat enough to feed 15 people and swallow cats whole — but his stomach was never satisified. They found Tarrare in a gutter, shoveling fistfuls of garbage into his mouth. It was the 1790s and Tarrare (born circa 1772, known only as “Tarrare”) was a soldier in the French Revolutionary Army with an almost inhuman appetite. The army had already quadrupled his rations, but even after downing enough food to feed four men, he would still scavenge through the refuse piles, guzzling down every discarded shred of waste they’d thrown away. And the strangest part of all this was that he always looked as though he were starving. The young man barely weighed 100 pounds and he seemed constantly tired and distracted. He was showing every possible sign of undernourishment – except, of course, that he was eating enough to feed a small barracks. There must have been a few of his comrades who just wanted to get rid of him. Tarrare, after all, not only burned through the army’s rations but also stunk so horribly that a visible vapor rose out of his body like real-life cartoon stink lines. But for two military surgeons, Dr. Courville and Baron Percy, Tarrare was too fascinating to let go. Who was this strange man, they wanted to know, who could have a wheelbarrow of food poured down his throat and still stay hungry? 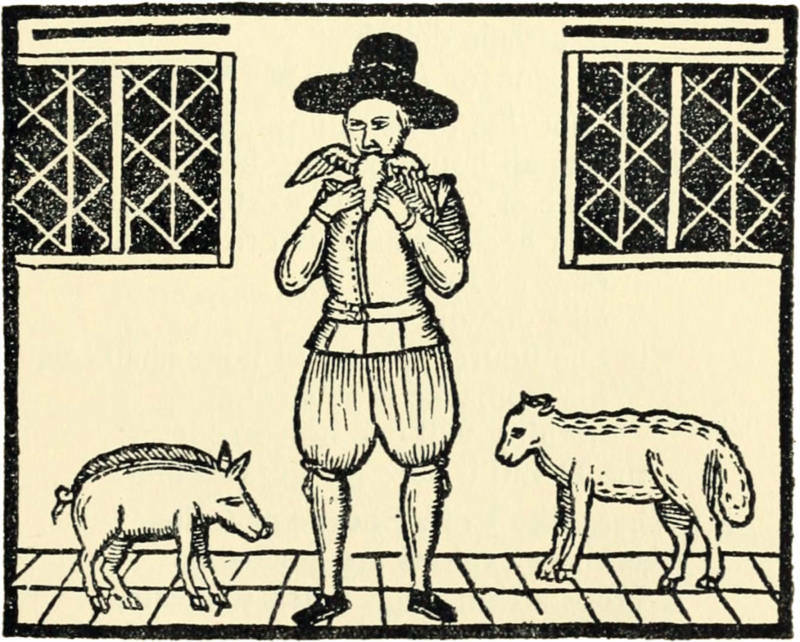 A 1630 woodcut showing polyphagia, Tarrare’s condition. 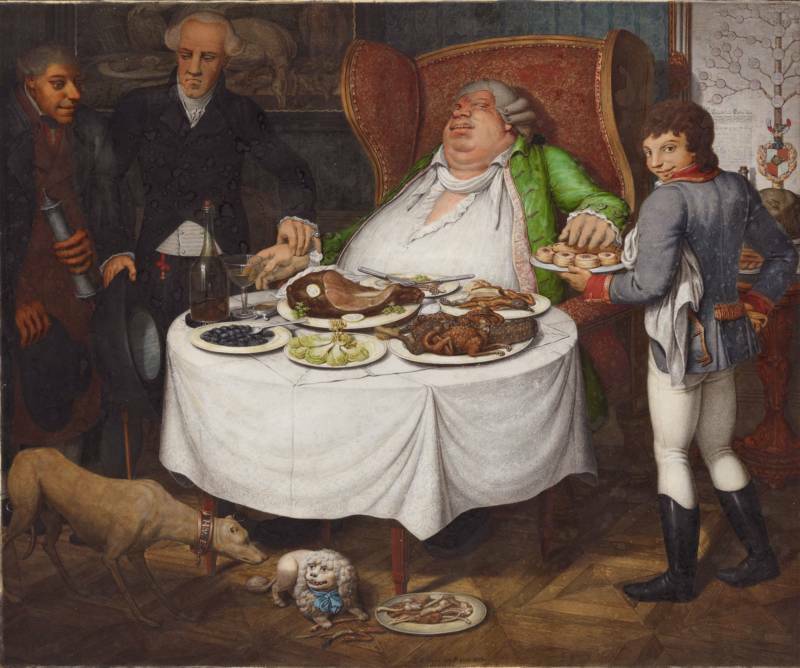 This one is meant to depict Nicholas Wood, the Great Eater of Kent. No depictions of Tarrare himself survive today. Tarrare’s strange appetite had been with him his whole life. It was completely insatiable, so much so that when he was a teenager, his parents, unable to afford the massive piles of food it took to feed him, kicked him out of their house. He then made his own way as a traveling showman. He fell in with a band of prostitutes and thieves who would tour France, putting on acts while they picked the audience’s pockets. Tarrare was one of their star attractions: the incredible man who could eat anything. His massive, deformed jaw would swing open so wide that he could pour a whole basket full of apples down his mouth and hold a dozen of them in his cheeks like a chipmunk. He would swallow corks, stones, and live animals whole, all to the joy and disgust of the crowd. “Der Völler” by Georg Emanuel Opitz. 1804. Tarrare baffled the surgeons. At the age of 17, he weighed just 100 pounds. And although he ate live animals and trash, he seemed to be sane. He was seemingly just a young man with an inexplicably insatiable appetite. When his stomach was empty, his skin would sag down so deeply that you could tie the hanging folds of skin around his waist like a belt. His cheeks would droop down like an elephant’s ears. These hanging folds of skin were part of the secret of how he could fit so much food in his mouth. His skin would stretch out like a rubber band, letting him stuff whole bushels of food inside of his massive cheeks. It was always on him, that horrible stench that seeped off of his body. His body was hot to the touch, so much so that the man dripped a constant sweat that stunk like sewer water. And it would rise off him in a vapor so putrid that you could see it drifting around him, a visible cloud of stink. 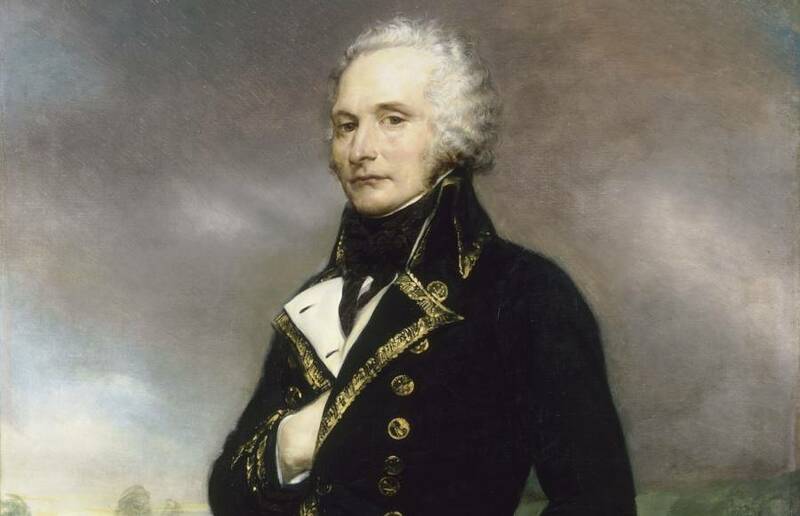 Alexandre de Beauharnais, the general who put Tarrare to use on the battlefield. 1834. By the time the doctors found him, Tarrare had given up his life as a sideshow performer to fight for France’s liberty. But France didn’t want him. He was pulled off the front lines and sent into a surgeon’s room, where Baron Percy and Dr. Courville ran test after test on him, trying to understand this medical marvel. One man, though, believed that Tarrare could help his country: General Alexandre de Beauharnais. France was now at war with Prussia and the general was convinced that Tarrare’s strange condition made him a perfect courier. General de Beauharnais ran an experiment: He put a document inside of a wooden box, had Tarrare eat it, and then waited for it to pass through his body. Then he had some poor, unfortunate soldier clean through Tarrare’s mess and fish out the box to see if the document could still be read. It worked – and Tarrare was given his first mission. Disguised as a Prussian peasant, he was to sneak past enemy lines to deliver a top-secret message to a captured French colonel. The message would be hidden inside of a box, safely enclosed inside of his stomach. 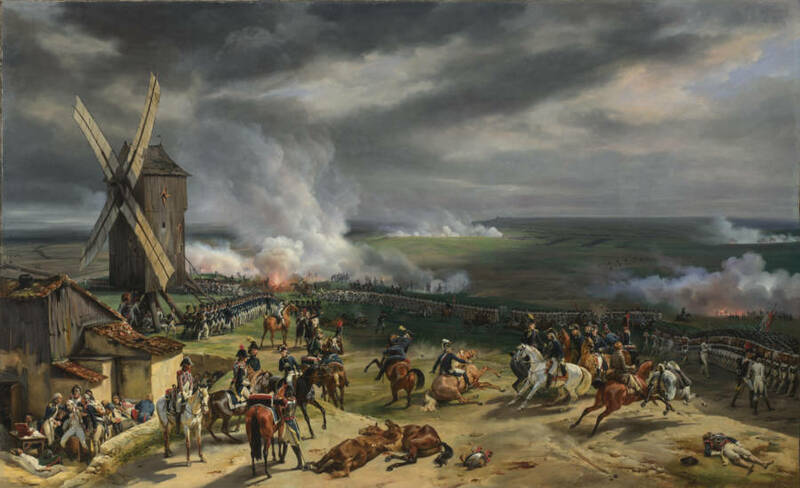 A scene from the Battle of Valmy, fought between France and Prussia in 1792. Tarrare didn’t get far. Perhaps they should have expected that the man with sagging skin and a putrid stench that could be smelled from miles away would attract attention instantly. And, as this supposed Prussian peasant couldn’t speak German, it didn’t take long for the Prussians to figure out that Tarrare was a French spy. He was stripped, searched, whipped, and tortured for the better part of a day before he gave up the plot. In time, Tarrare broke and told the Prussians about the secret message hiding in his stomach. They chained him to a latrine and waited. For hours, Tarrare had to sit there with his guilt and his grief, struggling with the knowledge that he’d let down his countrymen while he waited for his bowels to move. When they finally did, though, all the Prussian general found inside the box was a note that simply asked the recipient to let them know if Tarrare had delivered it successfully. General de Beauharnais, it turned out, still didn’t trust Tarrare enough to send him off with any real information. The whole thing had just been another test. The Prussian general was so furious that he ordered Tarrare to be hung. Once he’d calmed down, though, he felt a little pity for the flabby man openly sobbing on his gallows. He had a change of heart and let Tarrare go back to the French lines, warning him with a quick thrashing never to try a stunt like this again. 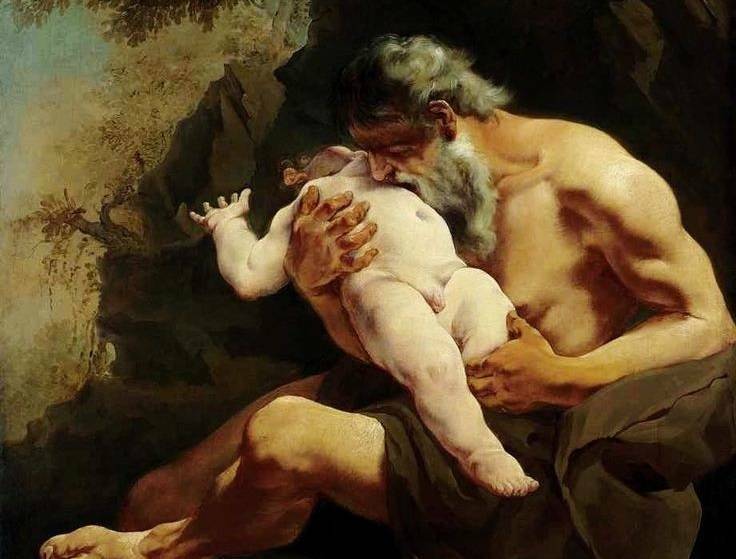 “Saturn Devouring His Son” by Giambattista Tiepolo. 1745. Safely back in France, Tarrare begged the army never to make him deliver another secret message. He didn’t want to be this way anymore, he told them, and he begged Baron Percy to make him like everyone else. Percy did his best. 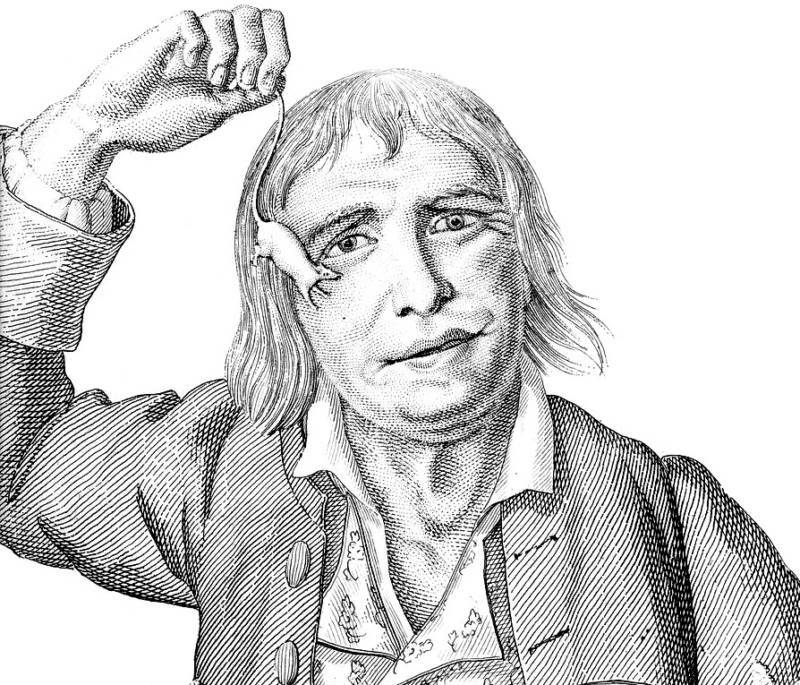 He fed Tarrare wine vinegar, tobacco pills, laudanum, and every medicine he could imagine in the hopes of quenching his incredible appetite, but Tarrare stayed the same no matter what he tried. If anything, he was hungrier than ever. No amount of food would satisfy him. The insatiable Tarrare sought out other meals in the worst possible places. During one desperate fit of hunger, he was caught drinking the blood that had been removed from the hospital’s patients and even eating some of the bodies in the morgue. When a 14-month-old baby disappeared and rumors started to spread that Tarrare was behind it, Baron Percy got fed up. He chased Tarrare out, forcing him to fend for himself from now on, and tried to erase the whole disturbing affair from his mind. Jacques de Falaise, another man with polyphagia who drew many comparisons to Tarrare. 1820. Four years later, though, Baron Percy received word that Tarrare had turned up in a hospital in Versailles. The man who could eat anything was dying, Percy learned. This would be his last chance to see this medical anomaly alive. Baron Percy was with Tarrare when he died of tuberculosis in 1798. For all the horrible smells that had drifted out of Tarrare while he was alive, nothing compared to the stench that poured out when he died. The doctors with him struggled to breathe through the noxious odors that filled every inch of the room. Perhaps they could have learned more about Tarrare’s strange condition – but the stench became so overpowering that even Baron Percy gave up. The doctors stopped the autopsy midway through, unable to bear a single second more of his stench. They’d learned one thing, though: Tarrare’s condition wasn’t in his mind. Every strange thing that he’d done had started with a genuine, constant biological need to eat. The poor man’s every experience had been dictated by the strange body he’d been born with, one that cursed him to a life of eternal hunger. I think this is one of the top ten most interesting stories I ever read. Never heard of him before.